Have you heard the one about the 95-year-old lady who wears a prosthetic leg? She can walk, drive a car, and leads a totally independent lifestyle. So, why does her son keeps pressuring her to move into a nursing home? He’s getting lonely living there by himself! It might sound like a joke, but it’s a true story. And just one example of how older prosthesis users can do much more than survive – they can thrive. Clearly, those who are thriving have a number of important qualities in common. The saying, “Age is a state of mind,” is important to people who lose a limb. They must try not to focus on age as the only measure of their ability to recover. Age provides a way to count years, but it doesn’t measure a person’s heart, mind or motivation. Some people in their 80s adapt to a prosthesis better than others who are 30 years younger. The difference is one of expectation. People who expect to do well are generally people who have a strong sense of purpose in their life – something beyond themselves that they feel is important. I met a 97-year-old lady in Ohio who is responsible for three great-grandchildren, ages 9, 10 and 11. She gets them off to school every day, has dinner for them every evening, and also looks after her 80-year-old son. Her expectation is that she is going to live to be 115, and she probably will. What do you expect for yourself? To be able to garden, to care for your family, to be independent? Do your rehabilitation team and family also expect a good outcome? Whether expectations are positive or negative, people tend to live up to them. Amputees and clinicians must look past stereotypes related to aging. You must expect that a positive outcome is possible whether you are 70, 80 or even 90 years old. The simple fact is that Americans – including prosthesis users – are living longer, healthier lives than ever before. Often when people begin wearing a prosthesis, their families and friends rally around them in a show of support. This plays an important part in the recovery process. It is also important for new amputees to assert their independence. Well-meaning loved ones can actually “kill with kindness” by doing too much for the new prosthesis user. One thing I’ve observed is families who want to get older adults a powered wheelchair to help them out. A wheelchair can be depressing to new amputees. Using a wheelchair can discourage them from making the effort to walk and try other basic activities. I encourage people who are beginning the rehabilitation process in a wheelchair to make getting out of the chair and up on their feet their No. 1 goal. And if they have to use a wheelchair they shouldn’t use one that’s electrically powered. The upper-body movement that’s required to move a manual wheelchair is actually great exercise. Functional level 0 is assigned to a person with no ability or potential to move about or transfer. Functional level 1 is assigned to a person with the ability or potential to transfer or move about on level surfaces at a fixed pace. Functional level 2 means the person has the ability or potential to move about and can cross low-level barriers like curbs. Functional level 3 is assigned to a person with the ability or potential to walk at variable speeds. Functional level 4 is reserved for exceptionally active individuals such as athletes and children. A person’s functional level is determined by the rehabilitation team, which includes the physician, prosthetist and therapists. Older adults are typically assigned a functional level of 1 or 2. As the functional level increases, so does the variety and sophistication of the prosthetic components that are available. Over the years, I have seen many older adults become motivated to work harder on their rehabilitation when they understand how functional levels work. Let’s use prosthetic feet as an example. Individuals at functional level 1 can have the most basic, single-axis foot that is made. At functional level 2, they can have a multi-axial foot and ankle. At functional level 3, they can select from a range of lightweight, dynamic feet. All prosthesis users should know their current functional level and ask their prosthetist what they can do to reach the next level. Older adults who start out at a functional level 1 may be able to work their way up to a functional level of 2 or 3. The higher functional level will give them the opportunity to acquire advanced, lightweight components that can help increase their mobility. Physical therapy is hard work that is well worth the effort. I recommend that older adults have physical therapy both before and after they get their prosthesis and schedule a return visit to their therapist each year. Therapy loosens up the residual limb and increases muscle tone and coordination. People who only go once or twice and then stop are missing out on the real benefits of physical therapy. 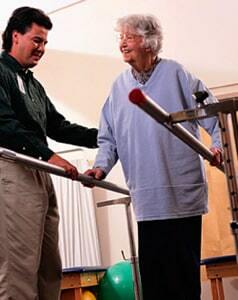 It is important to find a physical therapist who has experience with prosthesis users. An occupational therapist can also visit the home and help modify the living environment. Many important considerations go into the design of a prosthesis for an older adult. One of the most critical is its weight. Older adults usually have less strength and stamina and will function much better with a lighter limb. Legs that are too heavy cause users to feel a dragging sensation in every step, and, although they may get used to it, the weight is burdensome and tiring. The weight can discourage them from being active or from doing even simple things like going to the grocery store or to church. Some people may stop wearing their prosthesis altogether if it feels too heavy and uncomfortable. A heavy prosthesis also pulls on the skin of the residual limb. This is a special concern for older adults since the elasticity of their skin has decreased, making it more fragile and susceptible to breakdown. Each component of the older adult’s prosthesis needs to be as lightweight as possible. Ask about the materials in the component and how they affect the weight. For example, carbon composites, titanium and aluminum are much lighter materials than wood and stainless steel. Although there are many new and exciting knees, pylons, feet and ankles available, some of these components may increase the weight of the prosthesis. Therefore, consumers should carefully consider the benefits of the more specialized components they are interested in versus the weight they are adding. An adjustable foot that lets you wear different heel heights may sound great, but how often will you need that feature? If it’s once or twice a year, is it worth carrying around a heavier foot the rest of the time? Older adults with diabetes have to be especially careful about the fit of their prosthesis. People with diabetes often have a loss of sensation in their residual limb due to nerve damage or neuropathy. They may not know if their prosthesis is causing sore spots or pressure damage because they are unable to feel it. It is important for people with diabetes to examine the skin of their residual limb every day for potential signs of trouble. If they can’t see the bottom of their residual limb, they should use a mirror or ask someone to help them. People with diabetes must be diligent in their efforts to protect and monitor their residual limb as well as their remaining sound foot. Older adults who are successful prosthesis users have several important qualities in common. They are able to look beyond age and expect to have a full and active life. In many cases, older adults with a good understanding of functional levels are able to push themselves to a higher level of rehabilitation. This increases their choices of prosthetic components. Physical and occupational therapy are a key part of their recovery process. These prosthesis users understand why it’s important to have a lightweight prosthesis. They strive to be smart consumers in regard to prosthetic components and new technology. Finally, because many older adult prosthesis users also have diabetes, they dedicate themselves to carefully monitoring their residual limb and sound foot for any early signs of trouble. With a positive outlook and a willingness to work at their recovery, older adult prosthesis users can truly thrive!